Farrier's Formula® Double Concentrate should be fed with a good quality hay and grain ration. Eliminate any bran from the diet if possible. The phytate and phosphorus content of bran can alter calcium/phosphorus absorption or lead to other mineral imbalances. One-half (1/2) standard measuring cup (119 ml) will deliver 85 grams of product. One cup (237 ml) will deliver 170 grams of product. Top dress or mix with grain ration. Top dress or mix Farrier's Formula® Double Concentrate with regular feed. For each 450 kg of body weight use one-half (1/2) measuring cup (85 gm, or 119 ml) of product per day. 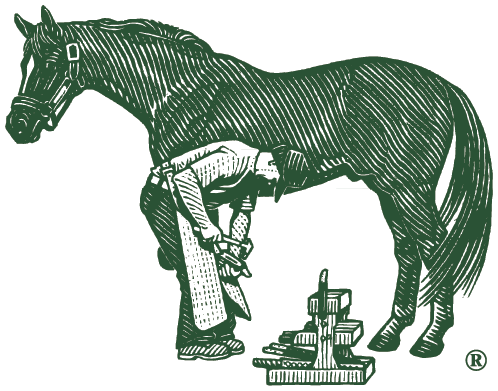 After feeding Farrier's Formula® Double Concentrate for 6 to 8 months and problems have resolved, the above "Adult Replenishment" amounts may possibly be reduced by one half. If problems re-occur, resume feeding at the above "Adult Replenishment" feeding levels. Feed Farrier's Formula® Double Concentrate at the level corresponding to the predicted adult weight from the chart above. Feed 1/8 measuring cup (2 tablespoons, 30 ml, or 22 grams) Farrier's Formula® Double Concentrate per day.